In the academic year 2011/12 the Anna Plowden Trust funded three students on the second year of the Textile Conservation course at the University of Glasgow. 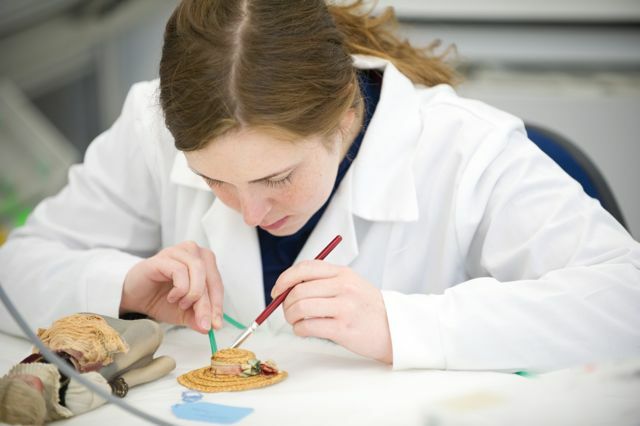 All three found the course both enjoyable and challenging and feel that they have both the practical skills and theoretical and scientific knowledge to be capable textile conservators. One of the students supported by the Trust was Beatrice Farmer. In summer 2011 Beatrice had a placement at the V&A, where one of her main tasks was to mount an Ozwald Boateng suit for the British Design 1946-2012 exhibition. This enabled her to develop her knowledge and expertise in the principles of costume mounting. Among the practical work undertaken by Beatrice in her final year was the conservation of a doll in Swiss-German national dress and a 20th century Nigerian dance sash. For her dissertation Beatrice researched alternative treatments for the removal of mould from historic textiles.